Many of the computer component designers and manufacturers on HEXUS reader watch lists have put a great deal of effort in making CPUs and GPUs that can work to speed up and improve the capabilities of AI systems. Nvidia and Intel both target multiple products at the deep learning, inferencing, and AI systems markets – and AMD just launched its latest 7nm CPUs and GPUs with an eye on the same, and other HPC markets. With these efforts in mind, it is sometimes good to see what AI applications are being worked upon, and some of the most interesting are in medical science. Earlier this week a study of AI-powered Alzheimer’s disease prediction was published in the journal Radiology. We are reminded that, as in the case of many diseases, early Alzheimer’s diagnosis can be extremely important for individuals as treatments and interventions are more effective early in the course of the disease. Unfortunately Alzheimer’s is a rather common condition, with more than 5 million Americans currently known to be affected. In the UK the number is 0.85 million – and 38 per cent of the population will have a close relative or friend fighting the disease. This is where AI steps in. The researchers trained a deep learning algorithm on a special imaging technology known as 18-F-fluorodeoxyglucose positron emission tomography (FDG-PET) where FDG is a radioactive glucose compound injected into patient’s bloodstream. Additionally the researchers had access to the Alzheimer's Disease Neuroimaging Initiative (ADNI) dataset of >2100 FDG-PET brain images from >1000 patients. Splitting this dataset 9:1 for deep learning:AI diagnosis the AI learned metabolic patterns that corresponded to Alzheimer's disease. 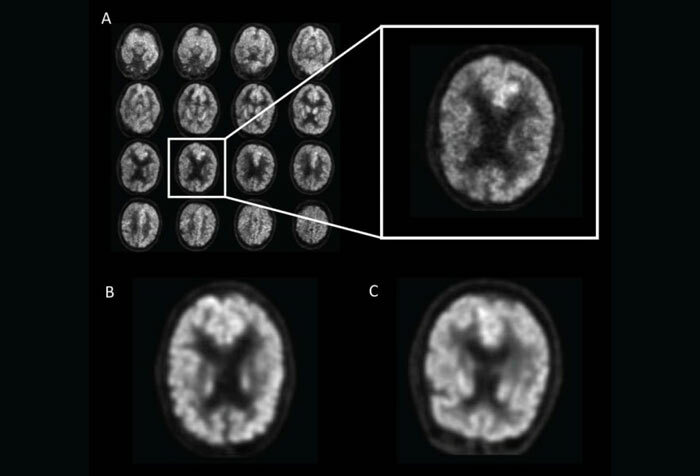 Example of fluorine 18 fluorodeoxyglucose PET images from Alzheimer's Disease Neuroimaging Initiative set preprocessed with the grid method for patients with Alzheimer disease (AD). After the above process the researchers tested the algorithm on an independent set of 40 imaging exams from 40 patients that it had never studied – impressively it “achieved 100 per cent sensitivity at detecting the disease an average of more than six years prior to the final diagnosis”. There was a word of caution from the researchers, following the headlining success, concerning the small-ish size of the dataset. Finally, it was revealed that to improve the quality of the AI further it is planned to add scan results showing a patient’s accumulation of beta-amyloid and tau proteins in the brain – another marker specific to the disease. And the Intel Thunderbolt protocol has been released, it will be royalty-free. 27 QOTW: What's caught your eye at CES 2019? Have you identified any must-buy gadgets, or is there something you're eager to see more of? Palm vein security bypassed using wax hand models QOTW: What did you get for Christmas? One of the most interesting reports about the use of AI I have read in a long time -,and one of the most profound and valuable applications for AI. I’m sure AI will find more applications is medical science as the technology develops. Great news item HEXUS (Mark) - thank you. Take your AI and sod off. I wanna keep my job as the department know-it-all. Can't have a computer taking that away from me. Or at least keep it in the Radiology department where it belongs. (EDIT: Away from me). EDIT: Yeh I am being sarcastic. I'm just feeling pretty ill and very, very bitter. Plus, how long until the AI learns the way of the amyloid protein due to too much data, goes all Skynet on us and destroys all out hearts, kidneys and gives us all early onset dementia? Cheaper than nukes and you essentially end up with a very marketable walking dead style scenario. Marketable to the new robot super-race that is. AI is mentioned so many times in eveything it might give people some kind of issue,I heard its called a migraine. I was trying to explain to myself the difference between AI and machine learning earlier. I failed. Badly. Because AI is used for everything… in everything and I got all confused. Had mates working on autonomous stuff over 10 years ago,and various aspects of data mining,etc. Never heard AI mentioned once. They missed a trick. They should have called it the medical nano-quantumdot- AI assisted encrypted autonomous high throughput systems biology enhanced global vehicular positioning system. Oh,and just add bioinformatics in there randomly. Everyone likes a good 'informatic! That would tick enough buzzwords on the grant application. Sorted.